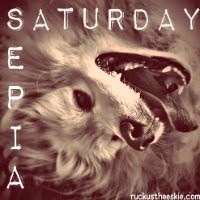 Ruckus the Eskie: Sepia Saturday #79: Unidentified Flying Object! Looks like we've got a bogey inbound! Yummy! Looks like the top of a muffin flyin' into your mouth! At first glance, we think it looks like some sort of a turtle. Have fun with that space alien. Hope you caught the invader! Did you catch it, Ruckus?